You may have heard of the Gut-Brain Axis. It’s been a hot topic among nutritional therapists and other health professionals for a while now. How the balance of your gut bacteria can affect your mood, mental health and even addictive behaviour. 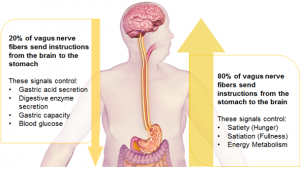 How the nervous system in your gut is not just for receiving instructions from your brain. In fact it largely sends information back up to your brain that influences its activity – primarily via the vagus nerve. How stress and emotions can trigger inflammation, muscle spasms and the secretion of mucous and fluids in your stomach and intestines. There’s a two-way relationship between your gut and your brain/central nervous system that just can’t be ignored. And there’s more. Let me introduce you to a third and very important member of the team: your adrenals. Whether wildcat or rabbit, in that moment you have downgraded all non-essential activity, including digestion. Instead, your resources are focused on your heart and external muscles (for running, fighting or freezing), and your brain activity has turned reptilian. The new, evolved frontal lobe of your brain, where you think things through, is too slow for dangerous situations, while your amygdala, the oldest part of your brain, can react instantly to keep you safe. Having reacted, through fight or flight or freezing, if you are now in a safe place again, you may find yourself shaking, laughing or sobbing. This is your basic reset. Pause for a second and ask yourself: how much resetting have you been doing lately? Or are you still a little frozen, or pumped up with adrenalin? So how does this fit into your gut-brain axis? Well, to begin with, your adrenal response directly affects whether your brain and nerve activity are being dominated by your calm, rational frontal lobe or your fear-based amygdala. And we know so much already about how your nervous system affects your gut. Your gut is extremely well connected to your nervous system, by so many nerve endings and neurotransmitters that it’s even known as the enteric nervous system, or sometimes as your second brain, or the brain in your gut. In addition, if you’re stuck in a long term fight/fight/freeze response, then you usually end up over producing cortisol. Cortisol is another adrenal hormone, which in an ideal world calms down inflammation. However, when your adrenals have been pumping out cortisol for too long, your body stops listening to it. Just as if you live by a busy road, after a while you stop hearing the drone of traffic. Which means you are now no good at calming down inflammation. Which means that any inflammation in your digestive system will have a hard time cooling off. Now remember that your digestive system has been downgraded, so you aren’t breaking foods down efficiently either. Which means that some of them may be causing irritation and inflammation in your gut. And while we’re on the subject, they’re may be a number of foods that are in your regular diet that may be agitating your gut already. Or maybe a lack of hydration, or a lack of certain nutrients it needs to keep your gut tissue healthy. Your body may be getting quite stressed about all this, which can additionally set your nerves on edge, and keep your adrenals fired up. Plus your adrenals will be sending out cortisol to quench the inflammation in your gut. Only this may have been going on so long now that your gut isn’t listening any more. And there you have it in the simplest terms. 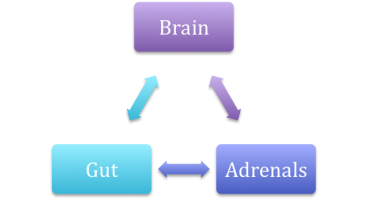 The Gut-Brain-Adrenal Axis, aka The Gut-Brain-Adrenal Triangle. It’s not an isolated little unit, however. Activating this triangle can impact on your physical and mental health in countless ways. It’s becoming increasingly acknowledged that long term inflammation underpins all chronic illness, including heart disease, diabetes, depression, cancer, asthma and rheumatoid arthritis. Like the Bermuda Triangle, it’s easy to get lost in here. The good news is, you can find your way out again, with the help of a few nutritional and lifestyle changes. I’ve found that this triangle sits naturally at the heart of all the work I do as a nutritional therapist, and so it’s the most useful thing I can share with you right now. So if you come for a consultation, you can be sure that I will be checking in to see how much support or soothing your Gut-Brain-Adrenal Triangle needs, and sharing some tools and dietary advice to help with this. 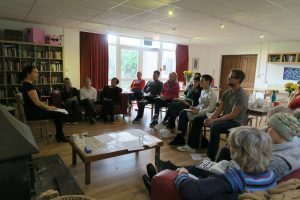 To find out more and learn practical ways of keeping your Gut-Brain-Adrenal axis*in balance, come to a Bloom Day Retreat and/or book in a consultation.